The HPPSC AE Syllabus 2019 is preparation is essential to the candidates. The Himachal Pradesh Public Service Commission officials mentioned the HPPSC Assistant Engineer Exam Pattern for the eligible candidates. Aspirants can check the HPPSC Assistant Engineer Syllabus details and download the syllabus for free of cost from this post. Applicable candidates must and should prepare the Himachal Pradesh AE Syllabus. Eligible candidates can download the HPPSC Assistant Engineer Syllabus which is helpful to the candidate’s preparation purpose. Contenders can download the subject wise Himachal Pradesh Assistant Engineer Syllabus for free of cost from this post and prepare thoroughly. For more HP PSC Assistant Engineer Syllabus details candidates can read this post completely and gather the required details. The HPPSC Assistant Engineer Syllabus is essential to the candidates who are still searching for the syllabus download links on other site and wasting their valuable time. For those candidates our RecruitmentIndia.in site. Applicable candidates can read this para and then get the required details about the HPPSC AE Syllabus 2019 and prepare to write the exam well. Some of the candidates can fail ion the exam without preparing the syllabus for those candidates we can upload the detailed info about the Himachal Pradesh Assistant Engineer Syllabus preparation. Applicants who are willing to prepare the HPPSC AE Syllabus 2019 those candidates can get the download links and also preparation tips from this post. Most of the candidates are searching for the syllabus and exam pattern on other sites and wasting their time for those candidates we can mention the HPPSC Assistant Engineer Exam Pattern in this post. The exam pattern consists of important details like time duration, total marks and number of questions coming in the exam. Applicants can also download the HP PSC Assistant Engineer Syllabus in addition to the previous papers for effective preparation. Assistant Engineer (Civil) 80 questions of multiple choice of B.E. (Civil) Degree level and 10 questions of G.K. of H.P. and 10 questions of all over World of 2 hours duration. Assistant Engineer (Electrical) 80 Questions multiple choice of B.E. (Electrical) Degree and 10 Questions G.K. of H.P. and 10 Questions G.K. of all over the world of 2 hours duration. Assistant Engineer (Mechanical) 80 Questions multiple choice of B.E. (Mechanical) Degree and 10 Questions G.K. of H.P. and 10 Questions G.K. of all over the world of 2 hours duration. Assistant Engineer (IT) (Part – A) A common paper containing 80 questions of multiple choice of Degree level on Information & Technology & Computer Science Engineering. (Part – B) 80 questions of multiple choice of Degree level on Electronics & Communication Engineering. (Part-C) 20 questions on G.K. will be common to both parts (Part A & B). 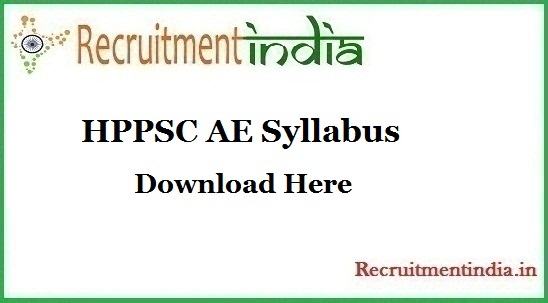 Here we can upload the HPPSC AE Syllabus 2019 details for the candidates who are in the process of searching for the syllabus but not getting proper info those candidates can refer to this post and download the syllabus without paying any cost from this post. Some of the candidates are waiting to download the HPPSC Assistant Engineer Syllabus for those candidates we can upload the links in this post. Candidates who want to get a govt job those candidates must and should prepare the Himachal Pradesh Assistant Engineer Syllabus. Check the required details about the HPPSC AE Syllabus 2019 which is very helpful to the candidates for the reason of getting highest marks in the exam. Candidates who can download the HP PSC Assistant Engineer Syllabus from this post and prepare those candidates can get a good result definitely. So, all the eligible candidates can download the Himachal Pradesh AE Syllabus and start preparing for the exam. Applicants are you searching for the Himachal Pradesh Assistant Engineer Syllabus then you can do the important thing is download the HPPSC Assistant Engineer Syllabus and prepare.